KENNEDY SPACE CENTER, Fla — The Kennedy Space Center Visitor Complex and the United States Astronaut Hall of Fame made a special announcement as well as conducted a groundbreaking ceremony at the Visitor Complex’s “Rocket Garden” today, Friday, May 29. 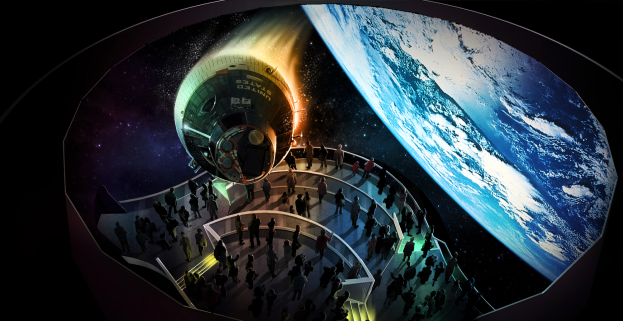 With an introduction provided by former CNN correspondent John Zarrella, the two organizations revealed that the new Astronaut Hall of Fame Complex, “Heroes and Legends” exhibit, will open at the Visitor Complex in 2016. The event was timed perfectly, with the 25th anniversary of the U.S. Astronaut Hall of Fame, which is poised to induct four new members tomorrow afternoon. 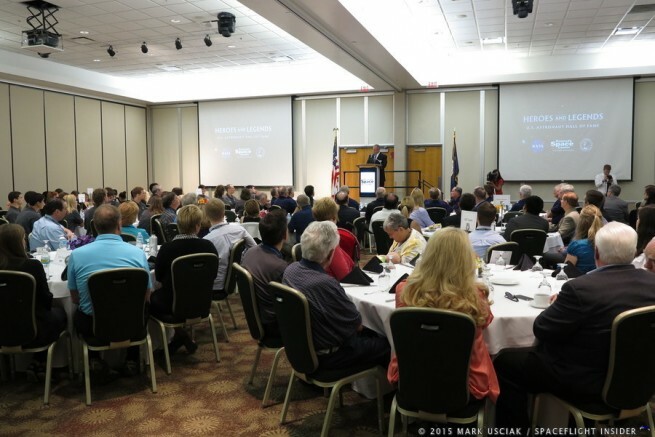 Today’s ceremony kicked off at 9:45 a.m. EDT at the Complex’s Debus Center. After a presentation detailing what the new facility would look like, the event moved outdoors to the Complex’s Rocket Garden. 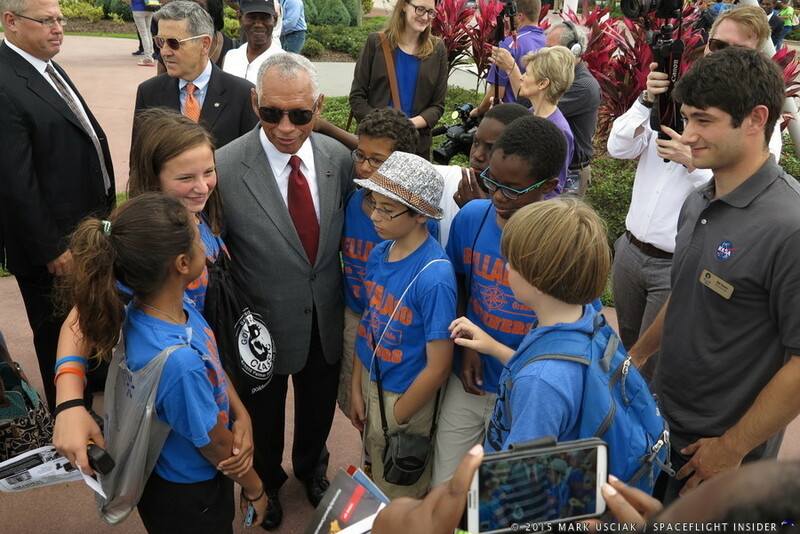 The ceremony had an array of special guests who included the current NASA Administrator and four-time space shuttle veteran Charles Bolden, NASA’s Kennedy Space Center Director Robert Cabana (himself also a former four-time shuttle astronaut) and numerous others. 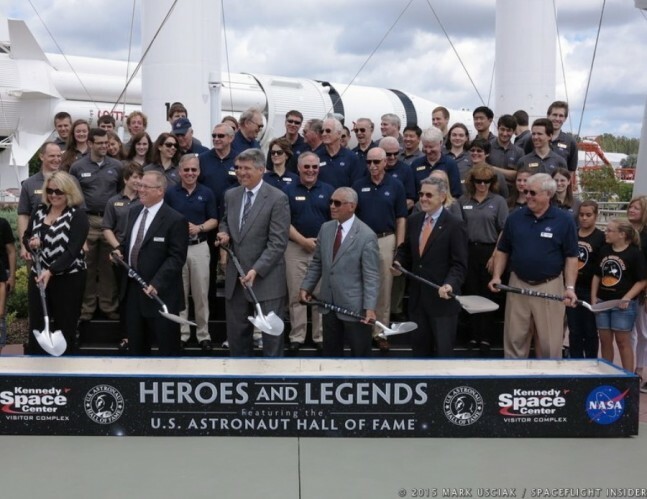 “Heroes and Legends promises to speak to the hearts and minds of all generations, from those who bore witness to some of America’s first space launches, to those who dream of someday being among the first to set foot on Mars,” Cabana said. Bolden and Cabana were joined by fellow shuttle veteran Dan Brandenstein, who is the chairman of the Astronaut Scholarship Foundation’s board of directors, NASA’s Cheryl Hurst, Therrin Protze (chief operating officer for Kennedy Space Center Visitor Complex), and Jim Houser, president of Delaware North’s parks and resorts business during the “groundbreaking” where the quartet shoveled sand out of a decorated box to mark the occasion. Numerous special guests were on hand to honor the occasion. These included, but were not limited to, recipients of the Astronaut Scholarship from the Astronaut Scholarship Foundation, and students from Apollo Elementary School in Titusville, Florida. On Saturday, May 30, four veteran space shuttle astronauts are poised to join the ranks of iconic U.S. astronauts such as Alan Shepard, John Glenn, Neil Armstrong and Sally Ride during the 2015 U.S. Astronaut Hall of Fame induction. This year’s inductees include John Grunsfeld, Steve Lindsey, Kent Rominger and Rhea Seddon. The KSC Visitors Center is way overpriced, I think they’re trying to keep up with Disney’s prices. Besides, I thought it was mandated by NASA that the Space Shuttles were suppose to go to museums that the public could easily access to see them for very minimum cost?. Discovery is at the Smithsonian and it’s free to see.